The Moto G line ruled the budget roost for several years, but Nokia has been muscling into that territory with some very tempting and eminently affordable Android phones. Now, Motorola is looking to win the market back with a G series reshuffle that brings us the Moto G7, Moto G7 Power, and Moto G7 Play. You may be wondering what sets these phones apart from one another. There are some important differences, so we’ve pitted them against one another here and picked winners in various categories to help you decide which would suit you best. Get your Moto running, because it’s time for a G series showdown. Whichever Moto G7 you pick, you’re going to find Qualcomm’s Snapdragon 632 processor inside. It offers solid performance and is capable of running most apps and games without a hitch. The Moto G7 is the most capable multitasker with 4GB of RAM inside, compared to 3GB in the Power, and just 2GB in the Play. If you like to have a lot of apps and games running, or you don’t like to wait, then you’ll find the extra RAM makes for a smoother and snappier experience. The G7 also has double the internal storage of its siblings with 64GB to their 32GB, although all three have MicroSD card slots for storage expansion. The G7 and G7 Play both have 3,000mAh batteries inside, but the Play definitely has more stamina, lasting an extra hour in our battery test, probably because the larger, higher-resolution screen of the G7 requires more power. The clear winner in the battery department is the appropriately-named G7 Power, which is packing a 5,000mAh battery. That’s enough power to see you through two days between charges. Speaking of charging, the G7 boasts TurboPower support at 15W, which will give you 9 hours of use from 15 minutes of charging. The G7 Power also supports 15W TurboPower, but the G7 Play charging maxes out at 10W, so it takes two hours to recharge from empty to full. This is a tricky category to call, though we can easily relegate the G7 Play to last place because of its limited RAM and slower charging. If battery life is a key consideration for you, then the G7 Power is the one to pick, but we’d opt for the extra RAM and storage of the G7. We can see popular design trends filtering down to the budget segment with the G series. The Moto G7 has a teardrop notch in the display, while the G7 Power and G7 Play both sport notches. 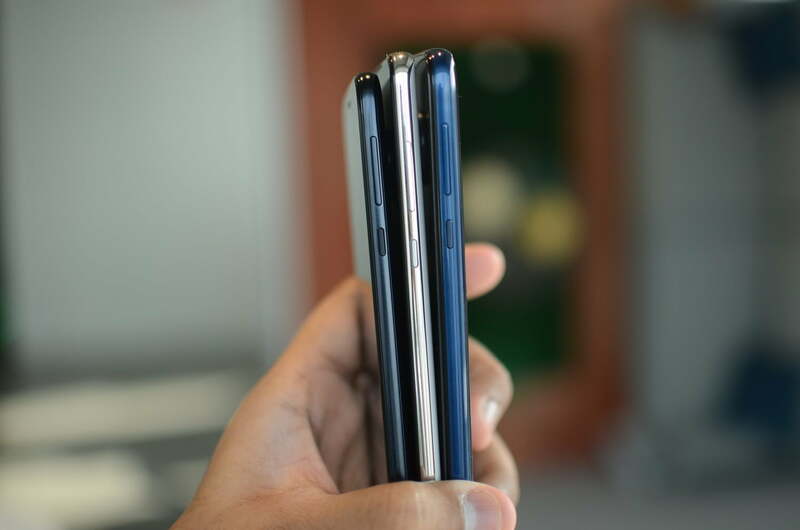 All three have bezels at the bottom of the front. The G7 is clearly the headliner here, with a curved Gorilla Glass 3 back. 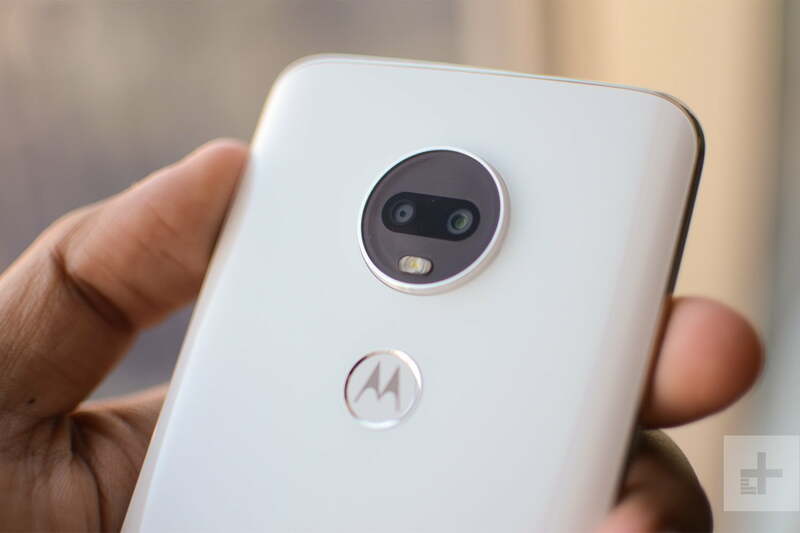 All three have a fingerprint sensor housed in the M logo, beneath that signature round camera module on the back. The G7 Power is thicker and has plastic with polymer glass on the back. The G7 Play has a more clearly plastic, textured finish on the back that aids grip, and is the smallest and lightest of the bunch by quite a bit. Most phones have some level of water resistance now, and while the G series lack IP ratings, they do all have a water-repellent coating from P2i. You won’t want to submerge them, but rain and spills are likely nothing to worry about. The G7 may be a little more prone to damage with that glass back, but there really isn’t much to divide them in terms of durability. The G7 and G7 Power have 6.2-inch displays compared to the 5.7-inch display in the G7 Play. 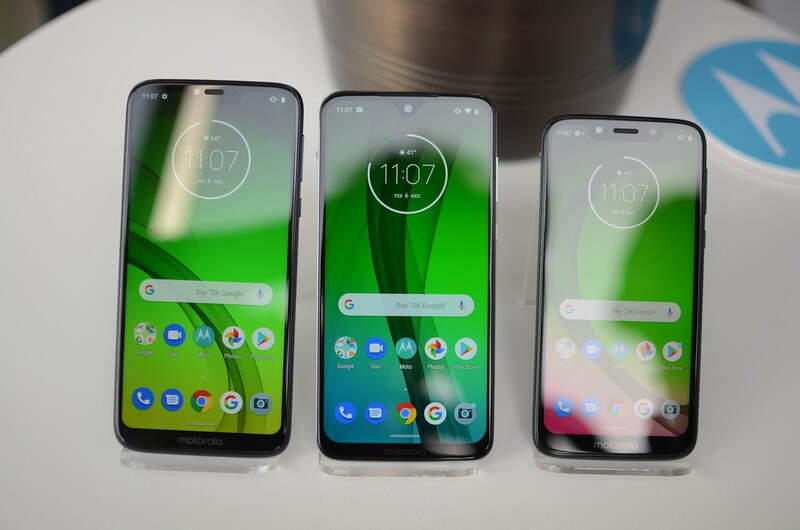 They are all LCD screens, but two things elevate the Moto G7’s screen above its siblings: It sports a much higher 2,270 x 1,080-pixel resolution and it has a teardrop notch. The G7 Play and Power both have larger notches at the top of the screen and relatively low resolutions. That means everything is going to look better on the G7. In terms of pixels per inch, the G7 is 403, compared to 271 for the Power and 294 for the Play. Here’s another clear win for the Moto G7, which boasts a dual-lens main camera that pairs a 12-megapixel sensor featuring an f/1.8 aperture with a secondary 5-megapixel sensor for depth, enabling you to capture great bokeh shots with the subject in sharp relief and the background blurred. The G7 Power has a single 12-megapixel sensor with an f/2.0 aperture and the Play has a single 13-megapixel sensor with an f/2.0 aperture. Bigger apertures, signified by lower numbers, let in more light, so the G7 camera performs noticeably better in low-light situations, though it’s still not great at dealing with the dark. The G7 has one exclusive feature over the other two — Auto Smile Capture, which snaps a photo as soon as a smile is detected. But the really enticing advantage is the portrait mode powered by that dual-lens camera. It can capture some pleasing shots of people, whereas portrait mode in the G7 Power and G7 Play is disastrous. All three phones have High-Res Zoom, which enhances the detail in photos after you zoom in digitally. They can also record 4K video, which is rare in budget phones, and there’s the option to create cool, time-lapse-style videos or record in slow motion. Each G7 variant is packing the same 8-megapixel front-facing camera, which is perfectly adequate for selfies and video calls. 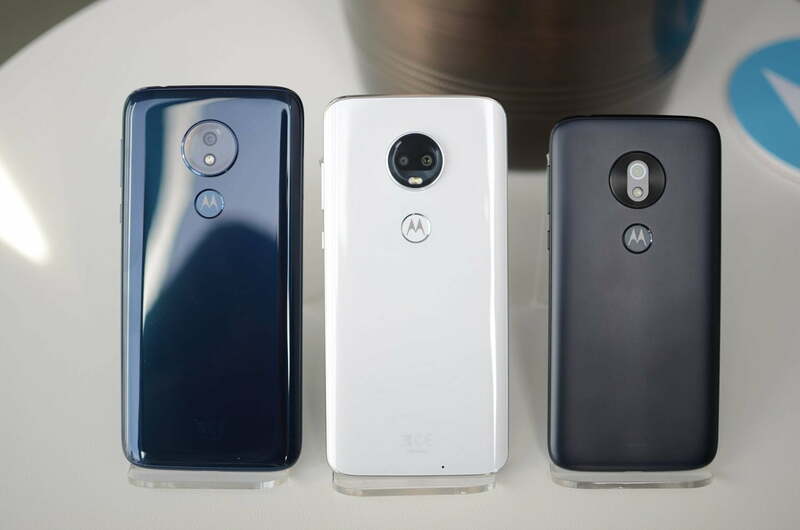 All three of these phones have Android 9.0 Pie out of the gate and we’ve been assured that they will all get upgraded to Android Q. That’s great news, because budget phones don’t always get updates. You’ll find the usual array of Motorola’s gesture shortcuts, including one-button navigation and chop twice for flashlight. There are a few other tricks, including the option to keep the display on if you’re looking at it. Only the Moto G7 has Moto Voice for hands-free operation of your phone while driving. The amount and type of bloatware you’ll find will likely depend on where you buy. The Moto G range has traditionally been relatively bloatware free, but Outlook crept in as the default email app last year, and if you buy from a carrier, they’ll likely load a bunch of apps on there that you don’t want. The software experience is identical with the exception of Moto Voice, so it’s a very narrow win for the G7. Budget phones are typically light on special features and extras, and that’s certainly the case here. The dual-lens camera in the G7 stands out as the biggest difference, but the extra stamina of the G7 Power should certainly tempt some people. It outperformed every other phone we’ve tested in the battery test, streaming video from YouTube for almost 14 hours, compared to 9 hours 21 minutes for the G7 Play and 8 hours 27 minutes for the G7. Other than its more compact size, there isn’t anything special about the G7 Play. We’re not surprised the Moto G7 is the most expensive of the bunch at $299. The Moto G7 Power will cost you $249, and the Moto G7 Play is $199. You can buy them unlocked direct from Motorola, or from retailers like Best Buy, B&H Photo, and Amazon. You’ll also find the G7 at Google Fi, Republic Wireless, and Ting. This trio will work just fine with all the major carriers, but we’d advise you to buy the unlocked versions to keep bloatware to a minimum. This is one of the most clear-cut comparisons we’ve ever done. The Moto G7 is by far the best-looking of the bunch, it boasts more RAM and storage, has a sharper display, and a better camera, but it’s also more expensive. The only area where it’s bested is battery life, which is obviously the G7 Power’s specialty. If you get annoyed about running out of battery all the time, then the G7 Power is for you. If money is tight, then the G7 Play will give you the best combination of performance, battery life, and camera for your money; remember that it’s a full $100 cheaper than the G7. If your budget will stretch, then the Moto G7 is clearly the best pick, but the other two have their charms and will suit some people better.